3100 is a key date for many in the galaxy - it signified the rise of heroes and villains. Peter Jameson became the first pilot to gain ‘Elite wings’ from the Pilots Federation, but it was at this time that the few Elite Pilots started to become greedy. Elite Status was coveted and difficult to obtain - and the demands placed upon those few pilots were considerable. The Pilots Federation had already existed for almost 300 years and assisted humanity to extend their reach to the stars, forming colonies and governments, and providing information and assistance to those who needed it. They were a noble group, but few in number. It is hypothesised that at this time, the Pilots Federation had discovered the key to control over the human expansion throughout the galaxy - Raxxla. The greatest of the Elite Pilots formed ‘The Elite Federation of Pilots’ (EFP), assumed control of Raxxla and thus the Pilots Federation. These pilots became ‘The Founders’. In response to this unethical control, a small band of pilots separated further from the Pilots Federation. This band became known as The Dark Wheel - a group devoted to discovering Raxxla and removing the control of the EFP. Notable members of the Dark Wheel include Rafe Zetter, Jason and Alex Ryder, Elyssia Fields. (The Dark Wheel, Holdstock & Premonition, Wagar), Neptune and Oberon Ryder (And Here The Wheel, Harper) as well as John Jameson Jr. The EFP have always been secretive, influencing corporations and governments for 200 years. They have created turmoil and peace. They have thwarted Alien invasion, but also caused mass-genocide. They have control over everything. The Pilots Federation itself is secretive, as communicated through the various Tourist Beacons located in Shinrarta Dezhra, but the near monopoly on ship systems and media is not enough to completely control the future of humanity. By controlling the Pilots Federation, the EPF have a large amount of control, but it is only through the infiltration of the governments that complete control had been carried out. Over the years, the EFP have manipulated governments, in particular the Federation, and have helped thwart the risks to humanity - the most obvious creation has been INRA. The department was formed following an arms race between the Federation and the Empire, which in itself was pre-arranged by the EPF, and was an alliance between the two military factions. It was formed to repel the Thargoid invasion in the early 3100’s, and culminated in the unethical use of a chemical weapon of mass destruction - Mycoid. They used the good intentioned, but somewhat naive Elite Pilot John Jameson Snr. He was hailed as a hero when he did not return from the mission, but later it was revealed that he was murdered on its completion. He accidentally discovered that the Mycoid virus was a genocide weapon when it had been sold as an anti-ship weapon. This appalled him, and he made contact with his son, John Jnr, to ensure the truth was spread. The EPF have many layers and have been known as many different names over the years. The Circle of Independent Elite Pilots (CIEP) formed when Neptune and Oberon Ryder had a disagreement within The Dark Wheel organisation. CIEP may have been infiltrated by the EFP and aligned their interests. By controlling both Raxxla and Soontil, the EFP would be able to dominate both humanity and the known alien race - the Thargoids. In more recent years, the EFP may have become known by another name - The Club. 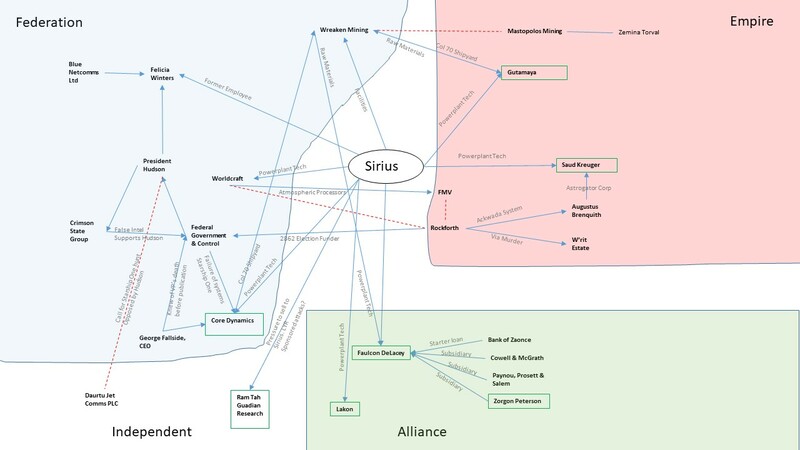 This manifestation of control comprises of five known associates - Infrastructure, Exo, Finance, Personnel and Society. Each is responsible for control over key parts of humanity. Society is responsible for misdirection - distracting the regular people to stop them looking for problems. The most likely candidate is within the <REDACTED>, and controls <REDACTED>...... as well as Galnet and other mainstream media outlets. Personnel is the one who places key people within organisations. This is most likely to be <REDACTED>....... - a key figure behind the scenes of the <REDACTED>. 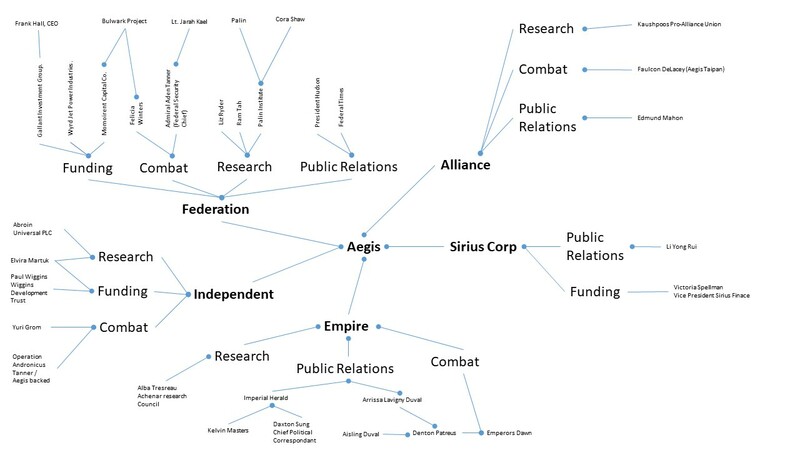 The influence of The Club has been discussed in detail in other CoR documents, so it shall only be a brief mention here: Sirius Corp, The Federal Government, The Pilots Federation, Galnet, The CQC Arena, most engineers, heavy influence in the Empire, and a degree of infiltration into the Alliance. Elyssia Fields had been a constant figure of The Dark Wheel for over 200 years, and had stayed alive much longer than an average human - she was a Clone from Teorge and had been able to extend her life thanks to genetic manipulation. Clones played a huge part in the story, allowing both The Dark Wheel and the EFP to form a continuous lineage of selected personalities. The Old worlds, in particular Teorge, were the hub for clone technology. Rebecca Weston (3122-3303) and Elyssia Fields (est 3100 - 3303) were both created there, and both have been described with the same features, brown hair and grey eyes. Other clones are known to be from the same DNA - notably Octavia Quinton and Kahina Tijani Loren. Octavia was a pirate lord and seemingly knew she was a clone. She attempted to acquire Kahina in order to steal her body… Kahina later assumed the name ‘Salomé’ and assisted The Dark Wheel to spread word of The Club during 3303. This line of clones ready to protect the lineage of The Dark Wheel has been echoed in other areas. The collapse of Galcop in the mid 3100’s left a power vacuum in the Core Worlds. Lave was the centre of those worlds, and it is believed that the EFP used its corporate might to fund the research of Dr. Hans Walden (Lave: Revolution, Stroud). He was a clone himself, and formed a dictatorship in Lave which prevented economic prosperity for almost 100 years. He rose to power in 3174, and maintained control until 3265. It is believed that there were at least seven Walden clones, each succeeding the previous when age began to become apparent. At least three of these clones were rescued by persons unknown at the end of the Walden era. Whilst the Walden Dictatorship was seemingly unconnected to wider events, it is plausible that the EPF have used it as an example of what could be achieved, and built on its foundation. It appears as if clone technology ensures the survival of each faction from one generation to the next and protects its leaders from absolute death. Hexedit is likely used to condition / transfer personality into the next generation of clones, because on their own a clone though genetically the same has different life experiences and something has to happen to implant or impart the personality on the clone. Essentially, the learnings and memories of previous incumbent clones can be passed down the line. Mycoid was the first chemical weapon distributed by the EFP via INRA, but it was not the last. Walden planned to wipe out humanity by spreading a genetically engineered virus into the food supply whilst immunising his own planet. More recently, the Cerberus Virus caused billions of deaths in a mainly Independent sector of the galaxy. Only the occasional case was discovered within the Federation. This latest plague may have been a distraction to occupy the population, engineered by Society. Dr. Hans Walden was convinced that humanity’s evolution had stalled. He believed that evolution could only occur following a mass-extinction event. He planned to create one using a bio-weapon. This ideal aligns with the main Club belief that humanity must evolve to beat the Thargoids when they return.To that end, a mass-extinction event has been in the Club’s plan for a long time - perhaps since the very start. Pivot was another forced evolution device. (Out of the Darkness, James). It is apparent that Pivot is also still ongoing in 3304 with the kidnap of commanders in escape pods, and the Imperial Flight Academy looking for ‘volunteers’. Carl Linnaeus’ diabolical scheme to remove those individuals who did not meet his exacting standards of IQ or ability fits the same ideal as Walden using biological weapons to wipe out everyone unsuitable for his own purpose. Where Walden’s scheme was Lave-centric, Linnaeus’ plan was somewhat grander. Although Linnaeus was killed, his plan survived. It is almost certain that the Pivot operation is being used by the Club. The Club also misled the Oresrians. They have prepared for the oncoming war by forcing an arms race between the Empire and Federation before announcing the alien ‘threat’ and forming AEGIS as a response force. They use AEGIS to develop weapons for use against the Thargoids. They have used the Federal and Imperial navies to guide the Oresians through our space - leading them through the bubble with captured Thargoid sensors. The transports are guided to pre-selected systems using a series of unregistered comms beacons. This is only part of the betrayal - ordinary pilots are guided to combat with the Oresrians by the AEGIS Eagle Eye Network. The Club plan is to disorientate the Oresrians, leading them on a meandering path through non-strategic target systems with Ammonia Worlds, allowing them to attack targets which contain stolen Thargoid technology, and eventually the system stations themselves if not held back. Meanwhile human advancement is made in the development of weapons against our near-captive Thargoids. Their scheme is to equip regular pilots with enough weaponry to put up a strong fight against the Klaxians. In the event of failure and if the Klaxians prove to strong to resist, the Club will make their escape - Operation Exodus - to the locations found during the Dynasty missions. You are not invited. You will die. The Club are planning to cause a mass extinction event by using the advancing Klaxian fleet. They will develop weapons based upon Guardian and Thargoid technology to give us the illusion of being able to win. The Club will take their selected personnel to the Dynasty locations while we are left to hold up the Klaxian advance. We cannot win. We must remove control from The Club / The Pilots Federation / The Cabal / The EFP / CIEP, and all of their various machinations. We align with The Dark Wheel. We are the Children of Raxxla. We Remember. The time for group secrets is over. 3305 will be the making or breaking of humanity's expansion into space. The Club aim to remove us from the board... we do not feature in their plans for the continuation of an evolved human race.. We have to rise against them. Rochester and her Club colleagues must fall. Any CGs which appeal for support from Nova Imperium or from the Federal government must fail. If they win, we WILL die. 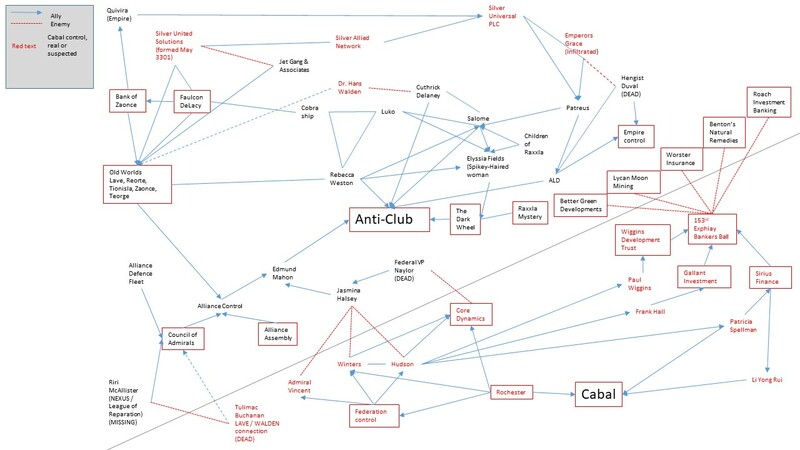 The Club in detail: (partially out-dated information. The interpretation of some of the sources require rework, but the Club members' descriptions and proof can be used with the OP document.